On-Line Component/Page InformationIn the online application, module and action are set to the component and page name respectively. In a search dialogue, Action is set to 'xyzzy'. Cobol/nVision InstrumentationCobol, nVision and SQR do not set module and action. Instead, they can be set at the start of every program initiated by Process Scheduler using a trigger on PSPRCSRQST. The first thing a process does when it is initiated is to set the run status on its scheduler request record to 7, indicating that it is processing. This is visible in the Process Monitor component. A trigger on this transition can set module and action for the session to the program and process instance number on that row of data. This technique was used prior to PeopleSoft adding instrumentation to PeopleTools. It can still be applied to all processes, including Application Engine, because any PeopleSoft instrumentation will simply overwrite the value set by the trigger. 2nd Database Connection InformationPeopleSoft programs use a second database connection to increment sequence numbers to minimise the row level locking on such tables. It is like an AUTONOMOUS_TRANSACTION in PL/SQL. There is no PeopleSoft instrumentation on this session. It is possible to use an AFTER LOGON trigger to set client_info, module and action. Oracle Automatic Workload Repository (AWR) SnapshotsPeopleSoft generates a lot of non-shareable SQL. PeopleTools Performance MetricsBatch TimingsPeopleSoft Application Engine and Cobol programs can emit batch timings reports on successful completion. Application EngineApplication Engine batch timings are controlled by the AETrace flag in the Process Scheduler domain configuration file and for on-line AE programs in the Application Server domain configuration files. CobolPeopleSoft Cobol programs can only write batching timings reports to file and not to the database. This is controlled by a different parameter. PeopleSoft Performance MonitorThis provides information about the performance of the PIA including response times for the online transactions. Metrics are stored in a separate monitoring PeopleSoft system to minimize the effect of measurement intrusion. It optionally samples the state of each web server, application server and process scheduler collecting operating system and Tuxedo metrics. It also has a PIA session trace capability. Committing and Restart Checkpointing in Application EngineIf a restartable Application Engine program fails it rolls back to the last commit point and it can then be restarted from that point. Committing is managed by Application Engine at section and step levels where the program state record is updated accordingly. If an error occurs in a step after the implicit commit in DBMS_STATS, it can result in the data in the application tables being different to where the state record indicates the program can be restarted. The program may not restart, or it could conceivably execute but produce erroneous results. If you code DBMS_STATS.GATHER_TABLE_STATS explicitly, Application Engine will not recognise the step as having committed. In the following example. you can see the %UpdateStats on the last step has been suppressed because it Application Engine does not recognise that the update in the first step has been committed by the call to DBMS_STATS. This approach became redundant from Oracle 11g with the introduction of table preferences. If you need to collect statistics with a specific rather than the automatic sample size or specify any other parameters, then a table preference should be defined. It applies whenever statistics are gathered on that table, during the statistics maintenance window, and any places where statistics are explicitly collected, rather than just a single call. PeopleSoft has always used regular database tables for temporary working storage in batch processes. Up to PeopleTools 7.x working storage tables were shared by all instances of a program. That led to consistent read contention when multiple processes concurrently used the same table, and much higher high water marks that increased durations of full scans. Package UsageUsually, the package will be run without any parameters. The default behaviour will be to truncate tables with more than a single extent. Information on what the package does is emitted to the server output. I explained in a previous blog that you can have all or none of the platform flags set to the same value, but with the platform radio button on the index properties dialogue box is still set to 'some' because one or more of the platform flag columns for some of the unsupported platforms is set differently. Of course, this is a purely cosmetic problem, but one that can cause confusion in Application Designer. PeopleTools 8.45PeopleTools 8.55I fix this by updating PeopleTools tables as follows. The first query reports on the indexes where the supported platform flags all have the same value and one of the unsupported platform flags are different. These are the indexes that have inconsistent platform flags. In this case PS_PSPMTRANSHIST is to be disabled on DB2/AS400. You can't update the flag via Application Designer, but you could set the radio button to ALL. It could be a tedious process to do this for a lot of indexes. So the following SQL commands correct all indexes. They set the SQL flags for the unsupported platforms to the value for the supported platforms if they are all the same. The version number on the record definition is updated so that Application Desinger refreshes the object. The new platformfix855.sql script is available on collection of miscellaneous scripts on Github. Metadata The table that holds the metadata should be defined in Application Designer. I will demonstrate this mechanism for nVision. The metadata is simply inserted into the table by script. Here we have 5 session parameters that will apply to all nVision reportbooks, but which I don't want to apply to the rest of the system. parallel_degree_level=150 scales up the automatic degree of parallelism calculation but within the parallel_degree_limit. See Kerry Osborne's blog 12c – parallel_degree_level (control for auto DOP). The specific setting for one particular operation ID and run control takes precedence of the generic setting for all reportbooks. In this case, I will scale the degree of parallelism further for a particular reportbook. Trigger When a process starts the first thing it does is update its own status to 7 to indicate that it is processing. This is another example of a trigger created on that transition that injects behaviour at the start of a PeopleSoft process. This trigger reads the metadata and applies the settings with an ALTER SESSION command. The process type, name, operation and run control attributes must exactly match the process request, but a blank space is treated as a wildcard. Underscore parameters must be delimited in double quotes. Testing The trigger can be tested by updating the process scheduler request table in SQL*Plus, but be careful to roll back the update afterwards rather than committing. The trigger writes debug information to the server output that can be seen in SQL*Plus showing the rule being used and the ALTER SESSION command generated. However, this output is not captured in any PeopleSoft log when the trigger is fired by a PeopleSoft process. I was listening to the section on Invalid Views in PSADMIN Podcast #117 (@19:00). Essentially, when you drop and recreate a view that is referenced by a second view, the status on the second view in the database goes invalid. This is not a huge problem because as soon as you query the second view it is compiled. However, you would like to know whether any change to a view prevents any dependent views from compiling, although you would expect have teased these errors out before migration to production. The PeopleSoft solution to this is to include all the dependent views in the Application Designer package. However, as pointed out, in the podcast you are now releasing code, possibly unintentionally releasing code changes and certainly updating last change dates on record definitions, when really you just need to compile the database objects. PeopleSoft does this because it is a platform generic solution, but really it is using the PeopleSoft Application Designer to solve a database management issue. A similar problem also occurs in the Oracle database with dependent PL/SQL procedures and packages where you sometimes get referential loops. Oracle provides a procedure DBMS_UTILITY.COMPILE_SCHEMA that recompiles all invalid objects in a schema and report any errors to the ALL_ERRORS view. I think this is a much safer option. Dropping and recreating view A renders view B invalid. Just querying B has made it valid again. Let's make B invalid again by rebuild A, but this time I will change the name of the column in view A from A to T so that view B cannot compile without an error. N.B. : if you use CREATE OR REPLACE VIEW is not left invalid unless there is an error. Unfortunately, Application Designer always drops and recreates views. ExampleLet's take the following nVision query as an example. Conclusion SQL Profiles can be used in much the same way as SQL Patches to introduce hints into application SQL without changing the code, the difference being that SQL Profiles can force match SQL. However, SQL Profiles do require the Tuning pack to be licenced, whereas SQL Patches and Baselines do not. The problem is discussed in Oracle support note E-NV: nVision Performance using Microsoft Office 2010 and above (Doc ID 1537491.1). Essentially, Excel 2010 upwards only runs single threaded. Only one Excel nVision process that is not waiting for a database call to return can run concurrently on any one Windows server at any one time. If you want to be able to run 10 concurrent nVision reports you would need to run one on each of 10 process schedulers, on 10 different windows servers. From PT8.54, OpenXML is the default and preferred engine for executing nVision report on the process scheduler. This uses a different PeopleSoft executable (PSNVSSRV). It does not suffer from the single-threading problem so multiple processes can run concurrently. It can also be run on non-Windows environments. Excel macros are ignored during report generation, although macros can be put into a layout that will execute when the generated report is subsequently opened in Excel. There are problems with nPlosion. Any print area set in the layout is lost. When rerunning nVision to file any pre-existing file is not overwritten. Separate process schedulers configured to run Excel rather than OpenXML on each available Windows server. Excel is selected by setting the variable Excel Automation = 1, in the nVision section of the process scheduler configuration file (psprcs.cfg). A new Excel nVision process type should be configured to run specific layouts or reportbooks on Excel. That new process type should only run on these additional process schedulers. It should have a maximum concurrence of 1, or at most 2, on each Process Scheduler. These schedulers should be configured to run this new process type (and a single Application Engine so that the purge process can run). Monthly partitioning is used for the previous fiscal year, 2016. These partitions are compressed, but using QUERY LOW which should deliver better performance with lower CPU overhead than QUERY HIGH (although usually there isn't much in it). If the selector tables are not partitioned, then each table will usually contain rows for many different selectors. Even with perfectly up to date statistics, including a histogram on SELECTOR_NUM, and extended statistics on SELECTOR_NUM and RANGE_FROM_nn, I have found that Oracle miscosts the join on RANGE_FROMnn and the attribute on the ledger table. I propose that the tree selector tables should be interval partition such that each selector goes into its own partition. nVision queries will reference a single selector with a literal value, and therefore Oracle will eliminate all but that single partition at parse time and will use the statistics on that partition to determine how to join it to other tables. Statistics only have to be maintained at partition level, and not at table level. Now that there is only a single selector number in any one partition, there is no need for extended statistics. The need to use dynamic selectors, in order to get equality joins between selectors and ledger tables, in order to make use of the Bloom filter, means that statistics on selector table will inevitably be out of date. The PL/SQL triggers and package that log the selector usage, are also used to maintain statistics on the partition. Partitions do not have to be created in advance. They will be created automatically by Oracle as they are required by the application. Compound Triggers on Tree Selector Tables There are a pair of compound DML triggers on each tree selector tables, one for insert and one for delete. The after row section captures the current selector number. The one for insert also counts the number of rows and tracks the minimum and maximum values of the RANGE_FROMnn and RANGE_TOnn columns. The after statement section updates the selector log. The insert trigger directly updates the statistics on the partition, including the minimum and maximum values of the range columns. It is not possible to collect statistics in a trigger in the conventional manner because dbms_stats includes an implicit commit. If dbms_stats was called within an autonomous transaction it could not see the uncommitted insert into the tree selector that fired the trigger. Hence the trigger calls the XX_NVISION_SELECTORS package that uses dbms_stats.set_table_stats and dbms_stats.set_column_stats to set values directly. The trigger then submits a job to database job scheduler that will collect statistics on the partition in the conventional way using dbms_job. The job number is recorded on the selector log. The job will be picked up by the scheduler when the insert commits. However, there can be a short lag between scheduling the job, and it running. The first query in the nVision report can be parsed before the statistics are available. The procedure that directly sets the statistics has to make some sensible assumptions about the data. These mostly lead the optimizer to produce good execution plans. However, testing has shown that performance can be better with conventionally collected statistics. Therefore, the trigger both directly sets statistics and submits the database job to collect the statistics. It is important that table level statistics are not maintained by either technique as this would lead to locking between sessions. Locking during partition statistics maintenance will not occur as no two sessions populate the same selector number, and each selector is in a different partition. A table statistics preference for granularity is set to PARTITION on each partitioned tree selector table. 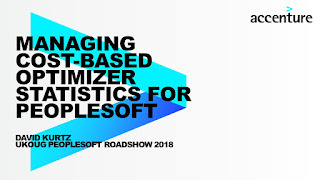 The combination of dynamics selectors, single value joins, interval partitioning of selector tables, logging triggers on the selector tables driving timely statistics maintenance on the partitions delivers execution plans that perform well and that make effective use of engineered system features. However, there are two problems that then have to be worked around. Some data warehouse systems can need new partitions in tables daily or even hourly. If partitions were not created in a timely fashion, the application would either break because the partition was missing, or performance would degrade as data accumulated in a single partition. Oracle intended interval partitions to free the DBA from the need to actively manage such partitioning on a day-to-day basis by creating them automatically as the data was inserted. However, on a busy nVision system, this solution could create thousands of new selectors in a single day, and therefore thousands of new partitions. This is certainly not how Oracle intended interval partitioning to be used. I freely admit that I am abusing the feature. If you have multiple concurrent nVision reports running, using dynamic selectors, you will have multiple database sessions concurrently inserting rows into the tree selector tables each with a different selector number, and therefore each creating new partitions mostly into the same tables. The recursive code that creates the new partitions, and maintains the data dictionary, acquires a lock the object handle in library cache to prevent other sessions from changing it at the same time. As the number of concurrent nVisions increase you will start to see nVision sessions waiting on the library cache lock event during the insert into the tree selector table while the new partition is being created. Perversely, as the performance of the nVision queries improve (as you refine tree selector settings) you may find this contention increases. The workaround to this is to create multiple database schemas, each with copies of the partitioned tree selector tables (similarly interval partitioned) and the PSTREESELCTL table (to manage static selectors in those schemas). Synonyms will be required for all other tables referenced by nVision queries. Then a trigger on the process scheduler request table PSPRCSRQST will arbitarily set the current schema of the nVision batch processes to one of those schemas. The nVision reports still connect and run with privileges of the Owner ID (usually SYSADM), but the objects tables from the current schema. I have used a hash function to distribute nVision processes between schemas. I suggest the number of schemas should be a power of 2 (ie, 2, 4, 8 etc.). Thus different nVision reports use different tree selector tables in different schemas rather than trying to create partitions in the same tree selector table, thus avoiding the library cache locking. Limitation on the Maximum Number of Partitions In Oracle, it is not possible to have more than 1048576 partitions in a table. That applies to all forms of partitioning. The tree selector tables are interval partitioned on selector number with an interval of 1 starting with 1. So the highest value of SELECTOR_NUM that they can store is 1048575. New selector numbers are allocated sequentially from PSTREESELNUM. Left unattended, the selector numbers used by nVision will increase until they eventually hit this limit, and then nVision and ad-hoc queries that use the tree-exists operator will start to fail with this error. package that will drop unwanted interval partitions. Recommendation: XX_NVISION_SELECTORS.RESET_SELECTOR_NUM should be scheduled run sufficiently frequently to prevent the selector number reaching the maximum. Now you can see various pieces of information about the selector and the report in which it was used. Length of the selector. Here it was 10 characters so it was in PSTREESELECT10. The number of rows inserted into the selector. This is useful if you want to recreate the conditions at runtime by populating the selector table manually. Time at which the selector was populated. Session module, usually the process name. Session action string, which contains the process instance, report ID and business unit. The client info string, containing the operator ID, database name, the name of the host running nVision and the name of the executable. psae is a PS/Query using the IN TREE operator that has been scheduled to run on the Process Scheduler. PSQED is the windows query client running in 2-tier mode and using an IN TREE operator. PSSAMSRV indicates either nVision or PS/Query running either through the PIA or on the windows client in 3-tier mode. Status of the selector. X indicates that the selector has been deleted and the partition has been dropped. Name of the schema in which the selector table is located. Partition name in the tree selector table in which the data was held. This will be blank if the partition has been dropped. The current values of the three tree selector flags on the tree definition are also reported. The following query aggregated log entries to report the number of times each tree was used over the last 7 days, and provide various statistics about the numbers of rows extracted from trees into the selector tables, and the current tree performance options. Literal values where possible when working with less than about 2000 rows in the selector. However, where more than 2000 rows it may be better to join the table due to parse and execution overhead of each criterion. This report can help to identify trees where extreme volumes mean that different options should be considered. The account trees have been set to join the tree to the ledger table rather than literal values because sometimes in excess of 6000 rows are extracted. A query with 6000 literal terms would be extremely large, take time to generate in nVision, and time on the database to parse and execute each criterion. STAT_PRODUCT has been set to join partly because it is large, it always extracts 2889 rows, but also because the whole tree is extracted every time so it does not cut down the result set. Static selectors are left in the PSTREESELECTnn table after the report completes so that they can be reused. However, many customers periodically create new effective dated versions of many trees, and so static selectors on old effective dated versions of the tree will accumulate as there is nothing to purge them. The size of the selector tables will tend to increase over time as old static and dynamic selectors are left behind. That in turn affects the statistics on these tables. The range of values for SELECTOR_NUM will become wider faster than the number of rows in the table grows. The minimum value will either be the oldest static selector number, or the oldest dynamic selector left after a crash. The maximum value will be the last selector number inserted when statistics were collected. Therefore, it is useful to be able to track creation and deletion of dynamic selectors by the various nVision reports and queries. I have therefore created a logging table PS_NVS_TREESLCTLOG (see nvision_dynamic_selectors.sql), a PL/SQL package XX_NVISION_SELECTORS and compound DML triggers on every tree selector table. The column names in the log table have been chosen for compatibility with the PeopleSoft data dictionary, so that a record can be defined in Application Designer. Unique identifier for tree selector records. Number of rows inserted into tree selector. Counted by the AFTER ROW part of the triggers. Module attribute of session inserting selector rows. Name of the application server or process scheduler domain. Name of the machine where the client process is executing. Name of the client executable process. Name of the tree from which selector extracted. Obtained by querying statement from V$SQL. Database Job number to collect statistics on the partition. All of the logic is kept in the PL/SQL package because it is common to the triggers on all the tree selector tables. Insert triggers track population of selectors and delete triggers track the successful removal of dynamic selectors. After row triggers track the selector number and count the number of rows inserted. After statement triggers call the logging procedures. Once the decision to bear the overhead of triggers on the selector tables is made, there are then various pieces of additional information that can be captured and stored in the logging table for very little additional overhead. It is easy to record the current session attributes such as module, action, and client_info. The process instance number is captured on startup and can then be read by the psftapi package. The tree is identified by scanning the V$SQL for the SQL that fired the triggers. It is also possible to maintain statistics on the selector tables. Purging SelectorsThe selector log can be used to drive purging of selectors not cleared by nVisions that failed to complete. The package includes a purge procedure to clear selectors that are not already marked as having been deleted either when the logged process instance is no longer running, or if there is no known process instance then if it is more than 2 days since the selector was inserted. If the selector table is also interval partitioned, then the partition will be dropped. A trigger on PSTREESELCTL (see pstreeselctl.sql) tracks the logs static selector maintenance. The purge process is invoked by a trigger on PSPRCSRQST that fires when nVision process status is changed away from processing. The selector purge process should also be scheduled to run daily. The selector log itself is not purged as it contains useful information about tree usage. If the tree selector tables are not partitioned create a histogram on SELECTOR_NUM. However, up to Oracle 11g, this will not be effective as the number of distinct values reaches the maximum number of buckets, 254. Dynamic selectors should be purged before this happens. From Oracle 12c the maximum number of buckets is 8192, and hybrid histograms can be used. However, we also need to know the report ID being run. When each individual nVision report starts it queries the runtime parameters from the PS_NVS_REPORT PeopleTools table. There is no update, so it is not possible to capture this with a DML trigger. Instead, you can create a fine-grained audit policy on the query with a PL/SQL handler. The handler package is then invoked by the audit policy. Maintenance TasksThe introduction of range partitioning on FISCAL_YEAR brings some regular maintenance tasks. Managing Partitioning in PeopleSoftApplication Designer is not good at managing partitioning. I have written previously about the limited support for partitioning introduced in PeopleTools 8.54. It uses Oracle's DBMS_METADATA package to preserve existing settings, including partitioning, but the support for initially implementing partitioning is poor. It may be reasonable to manually manage partitioning in a single table, but if you also have a number of summary ledgers, and have perhaps also built materialized views on them, you can have a significant number of partitioned objects to manage. Manual scripting is going to become a significant overhead. You might want to look at Managing Oracle Table Partitioning in PeopleSoft Applications with GFC_PSPART package. RecommendationsIt is easy to see how you might build up a large number of indexes on the ledger and summary ledger tables. You might have pairs of indexes, one for single accounting periods and perhaps another similar one for year-to-date for each set of analysis criteria. Literal ValuesWhen 'use literal values' is selected nVision replaces the join to the tree selector table with a set of literal values generated from the contents of the tree selector table. RecommendationsIn general, the literal values option is very beneficial. 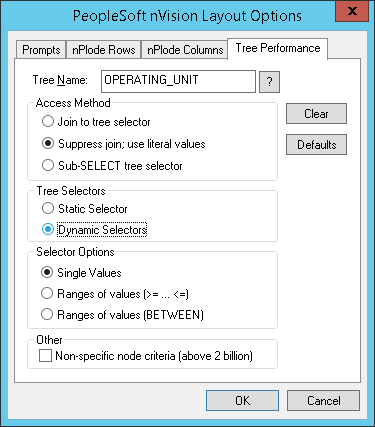 Tree SelectorsThis option allows you to choose whether a tree selector is managed in a static or dynamic manner. As you will see, the Tree Selectors performance option is tied in with the Selector Options performance option. StaticWhere a tree uses a static selector, the entire tree is extracted into the tree selector. There will be no tree node number criteria in the extract statement. DynamicDynamic selectors are built on-the-fly by nVision as the report runs. They select just the rows from the tree that are required by the report. RecommendationsAlthough static selectors are easier to manage, the decision to use dynamic selectors is driven by the need to use single value joins. Selector OptionsThis performance option controls how the tree selector is joined to the ledger table. The choice is between single value equality joins or inequality joins. Ranged JoinsThere are two forms of ranged joins, either using the BETWEEN keyword or using a pair of inequalities. There is no difference to Oracle because the optimizer rewrites BETWEEN as a pair of inequalities. Single Value JoinsIf single value joins are selected, nVision generates an equality join between the tree selector and the ledger table. The tree selector must be dynamic, and nVision extracts all the intermediate values between the tree node ranges on the underlying detail table. RecommendationsIn general, I would recommend using single value joins and therefore also dynamic selectors. The main advantage is that they enable two particular optimisations in Oracle. At no point when defining a nVision report does the developer directly specify a SQL statement, all the SQL is generated by nVision from the report definition. That also means that it is not possible to directly intervene and change the SQL statement, for example, to add an optimizer hint. However, the way that the SQL is generated can be controlled via the nVision performance options. Setting this appropriately can make a significant difference to nVision performance, but the optimal settings will differ from system to system, from tree to tree and sometimes even report to report. 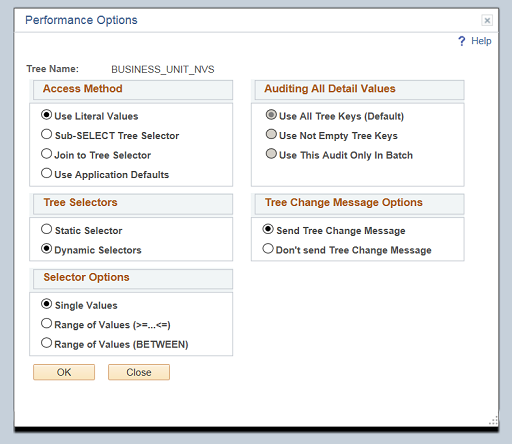 Specification of Performance OptionsnVision performance options are specified for named trees. Since PeopleTools 8, they are defined in the tree definition. They are stored in the database in PeopleTools table PSTREEDEFN. Performance options can also be specified in individual layouts, and the specific definition in the layout overrides the generic definition in the tree. 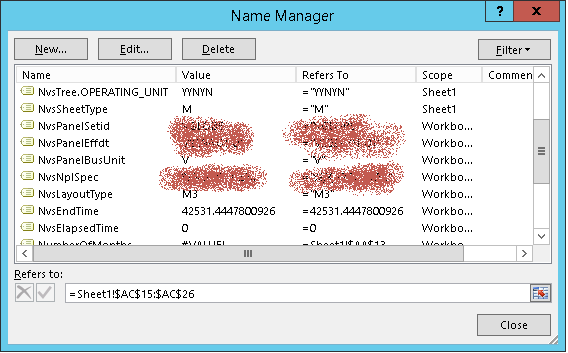 You can also see the trees defined in a layout file in the Name Manager in Excel. The performance options are converted into a string of 5 characters. Below you can see a tree called OPERATING_UNIT. The easiest way to determine whether performance options are set in a layout is to look in the Name Manager, and the only reliable way to delete a performance option from a layout is to delete them from the Name Manager. The string of flags in the NvsTree formula can be decoded with this table. ﻿RecommendationsIt is rare to need to set different performance options for the same tree in different layouts. Therefore, it is easiest to set performance options at tree level and not at all in layouts unless absolutely necessary. If you have specified them in layouts in the past, then remove them unless you really do need to use a different option in a particular report. Some customers have written Visual Basic macros to work through all their layouts and remove all tree performance options settings.